Whatsapp is the second most popular app after Android's PlayStore's Facebook, and this app is in the top of the page. In this case, giving new features and being ad-free has become a specialty of WhatsApp. 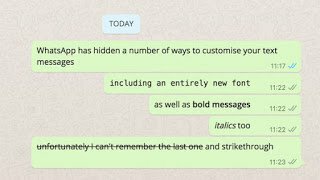 In the picture above you saw how the new text style can be used in WhatsApp, but we will tell you how to do it. 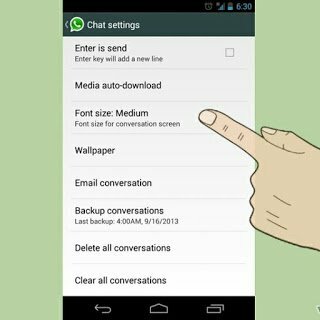 First of all, it is important to have WhatsApp on your phone, so that these tricks can try by you. Know how to change the font size. For this, you have to open your Whatsapp. Then go to Settings >> Chat Settings >> Font Size. Now you can choose the size of your favorite font. How to use different text styles? You can turn any word or phrases into bold by putting the * before and after them. You can convert any word or phrases to italic by putting the _ before and after them. You can turn any word or phrases into a strike-through by putting the ~ before and after them.